If your work involves constant or near constant use of your hands, you are at risk for repetitive motion injuries such as carpal tunnel syndrome (“CTS”). Carpel tunnel syndrome occurs when the median nerve, which runs from the forearm to the palm of the hand, become compressed (squeezed) at the wrist. The cause of the “squeezing” is swelling of the tendon and other soft tissues surrounding the nerve With the nerve partially blocked, you may experience weakness, pain, numbness and tingling in the palm of your hand, your fingers and in your wrist. I have also seen CTS result from vehicle accidents where my client braced for impact by squeezing the steering wheel. Another repetitive motion condition that may cause numbness, tingling and pain in your forearm and hand is called cubital tunnel syndrome. Like carpal tunnel, cubital tunnel involves swelling and interference with the functioning of a nerve, but in the elbow rather than the wrist. Cubital tunnel often arises when a worker has to keep his elbow bent constantly at work. Generally, your doctor will need to send you out for a nerve conduction test called an EMG (electromyography). The EMG will measure the conductivity of electrical impulses within your nerves and thus determine whether you have a blockage. Repetitive motion injuries like carpal tunnel and cubital tunnel are compensable work injuries because they often arise out of and in the course of employment. If you begin experiencing numbness and tingling in your forearms, hands, wrists or fingers, I urge you to report your symptoms to your employer. As I note in the video above, notice can be one of the issues that causes problems in a carpal tunnel or cubital tunnel case. Often the onset of numbness and pain is gradual and you may not even realize that your condition is work related. I have also found that sometimes numbness and pain radiating down the arm may arise from a cervical spine issue rather than from a repetitive motion injury. This too may be work related, and you should report your symptoms as soon as possible. In talking to clients and prospective clients I understand that you may be concerned about reporting a possible on-the-job injury because you do not want to lose your job. If this is the case, I would invite you to call me first to discuss your symptoms and what might happen if you file a job injury report. All communication between us will remain completely confidential and you will not obligate yourself or commit to filing a job injury claim by talking to me. 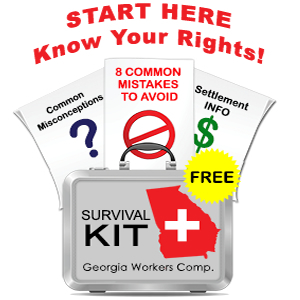 Obviously I think you will want to avoid the situation where your symptoms become so severe that you cannot work but you have forfeited your opportunity to have your arm and hand treated under workers’ compensation medical care because you did not file a claim. If I can offer perspective to you about how your case might proceed, I am happy to do so – call me at 770-351-0801 or email me by using the form.